Founded in the year 2000 as a business unit, the Specs Research Laboratory (SRL) is a reliable partner for outsourcing research and development for pharmaceutical, agrochemical and biotechnology industries. Working on a large number of projects for these industries the SRL has gained valuable expertise in (bio-) organic chemistry, physical organic chemistry and homogeneous catalysis. Outsourcing of known chemistry can be contracted to the SRL on the basis of an agreed fixed fee or FTE-rate. The laboratory provides versatile state-of-the-art facilities for synthesis and research activities. 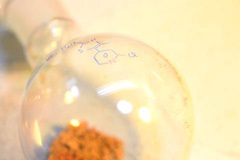 It is run by experienced Ph.D.'s with expertise in various fields of Organic Chemistry and Homogeneous Catalysis. Besides that, the SRL can also carry out the follow-up on hit molecules from lead discovery programs.